Reader Top Ten: The Ten Greatest Science Fiction Films of the 1970s? “In particular, I want to know the answer to one question. What are your selections for the ten best science fiction films of the 1970s? John is right, of course. It was a maelström of economic recession, oil crises, Vietnam, Watergate, terrorism. Disco. Filmmakers reflected back on the eyes of viewers across movie screens. And yet, some surprising mood-lifting work graced cinema houses, too. Motion pictures that could only find their way into people’s hearts during this span of time. Like John’s, and the 70s itself, mine will be a mix of both views. Alien (1979) – I’ll flip the order of the John’s first two picks. Maybe this says something about me having lived through this decidedly turbulent period as a young adult than as a youth. 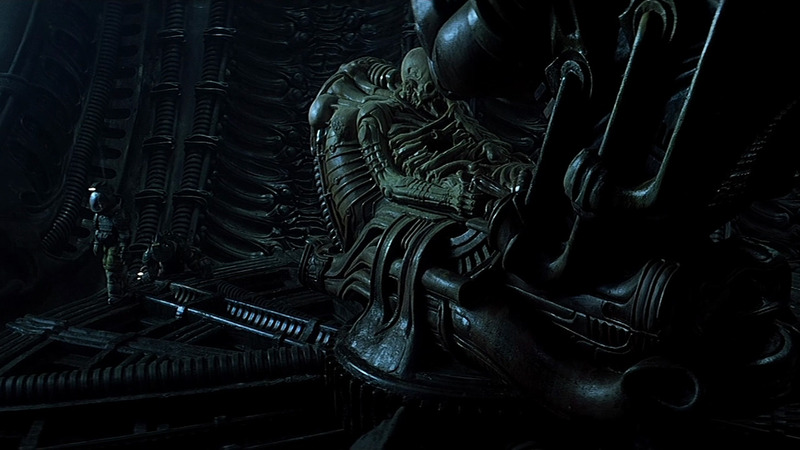 No matter, Ridley Scott’s masterful film works as both a horror film and sterling piece of science-fiction. One that had something to say about our future living with corporations. Close Encounters of the Third Kind (1977) – Steven Spielberg’s polished sci-fi film seems to get lost in people’s reflections when looking upon his career. A film that brought the ‘awe’ in awe-inspiring for those of us who caught this on the big screen. Though he and I (post-family life) wouldn’t make Roy Neary’s choice at the end, but back then, oh yes. 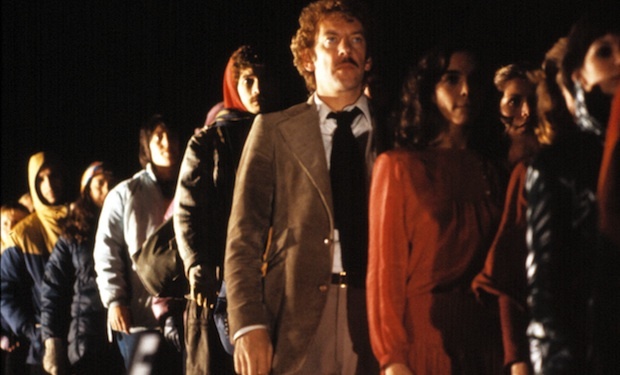 Invasion of the Body Snatchers (1978) – While Don Siegel’s 1956 original sci-fi/horror/film noir masterpiece remains my favorite, Philip Kaufman’s late-70s remake is still stellar. Eerie in the way of horror, but sublime in its story of suspense that we think we can somehow get out of the decade unscathed. Huh uh. Like the first, the film fits its time to a tee. 6. Time After Time (1979) – Nicholas Meyer, the same filmmaker who would deliver the two best Star Trek films in the entire series years later, crafted one of the small yet best time travel films with this effort. An odd but endearing love story concoction involving H.G. Wells, Jack-the-Ripper, and liberal-feminism in the quaint realm of 70s San Francisco. 7. 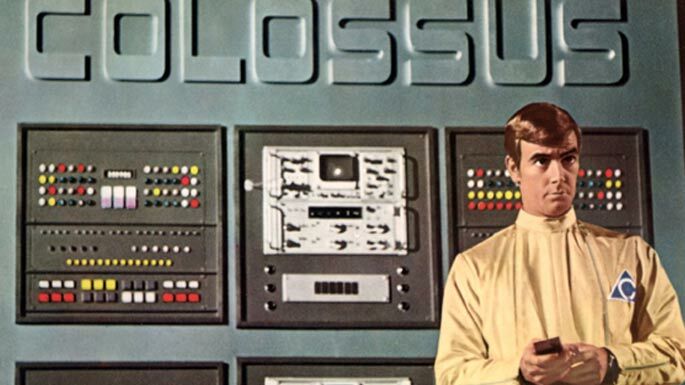 Colossus: the Forbin Project (1970) – Believe me, this early 70s gem doesn’t get the respect it deserves. Joseph Sargent delivered a wonderful adaptation of D.F. Jones’s 1955 source novel. Want to know where James Cameron’s Terminator got its vision of a nightmare ‘Skynet’ future? Go no further than this unsung masterpiece of Cold War science-fiction. 9. 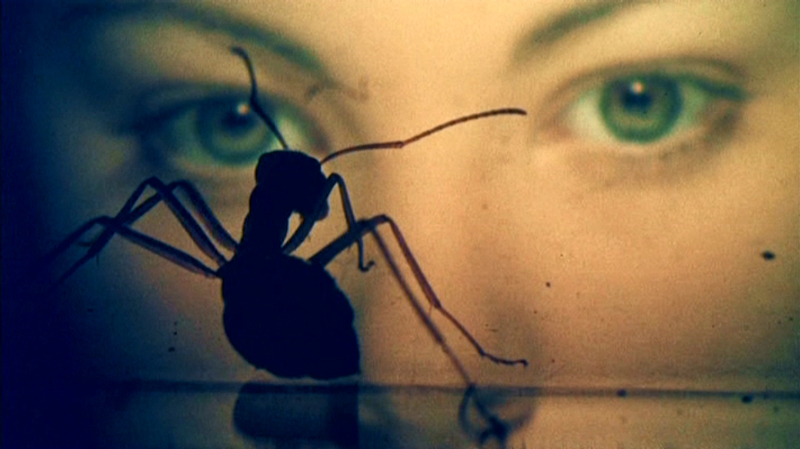 Phase IV (1974) – The legendary American graphic artist and film title designer Saul Bass directed only one feature film in his notable career. And this intelligent sci-fi film was it. Like some films birthed during the 70s, history has left a few of them on the scrap-heap. A superbly astute film that didn’t need a big budget or spectacular special effects to work. 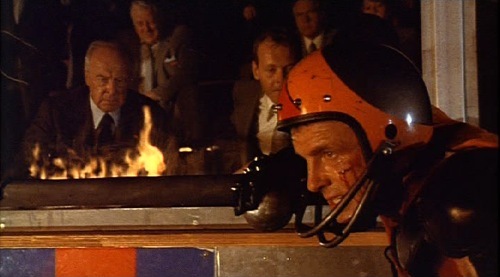 Rollerball (1975) – I’ll close with an underappreciated film by Norman Jewison. It bookends my list with another dark corporate-controlled future piece. A story involving athletes participating in violent televised showcases to placate the masses. To make them forget their humanity amid the corporate state’s dominion over them. Sound familiar? Honorable mentions include The Black Hole, Soylent Green, Westworld, The Omega Man, A Boy and His Dog, and Slaughterhouse Five. I should mention, Superman: The Movie remains one of my all-time favorite films, as I noted here. For whatever reason, I do not include comic book characters in my science-fiction lists. It’s just me. Lastly, I’ve not seen the original version of Solaris, or even its more recent film remake. Something I should fix, and soon, I think. I hope you do, Nostra. Many thanks, my friend. Great list Michael. It’s a hard one to compile and your top two are hard to argue with. I’d probably put Spielberg’s Close Encounters as my #1 though. Great choice, Mark. Thinking about, I need to tee that Spielberg film up once more. Thank you very much. Great list, especially for additions to my “lost gems” category. The Saul bass flick will my first exploration. the fact that you mention the budget being small is a huge plus and must mean the visual story pulls the weight. my knind of picture!! It does, jn. The Saul Bass film is a lost gem, indeed. At least, JKM and I do 😉 Please let me know what you think. Many thanks for the read and comment. Much appreciated. Well, I would have to knockout a couple of suggestions personally, especially the first STAR TREK (nice defence but I go with most Trekkers and prefer the second one) and I have never been able to understand why anyone liked ROLLERBALL – much rather have the likes of MOON and BLADE RUNNER. Really glad to se ANDROMEDA in there. Have you seen Robert Wise’s director’s cut for his film? It might change your mind. Of course, I do love Wrath of Khan even more, but we were limited to the 70s. I am a bit of a rebel, as you can see with my selections ;-). Many thanks, Sergio. Not a problem, Sergio. And thanks very much for the recommendation of another sci-fi film I need to take in. It’s cool to see Time After Time in the 1978 Invasion of the Body Snatchers on this list. Both are excellent films and deserve more attention. Very strong list across the board! Lots of great recommendations here Michael, thanks for that! Since I’ve only seen a couple from your list, I definitely need to check out more. I always love a good sci-fi! There are some great ones here, I think. Please let me know what you think of them once you catch them, Ruth. Many thanks, my friend. Love the list especially the top 2. I think I would switch them around but both are fantastic! Thank you so much, Keith. Much appreciated, my friend. Solid list. Definitely try checking Solaris, that would probably be my number one. I certainly will, ckckred. Its loyal fans make it must, I think. Thank you very much, my friend. Excellent run down of classic 1970s Science Fiction! Great to see ‘Phase IV’ included. One of least known, yet refreshingly cerebral offering in the genre. Always pleased to see ‘Colossus: The Forbin Project’ receive some proper accolades. Even in this day of computers becoming our Big Brother and benevolent overlords. Likewise, ‘The Andromeda Strain’. Which is adult science fiction done right! Great catch on ‘Time After Time’. One of the “go to” date night films of that era. Great to hear, Kevin! Glad to hear you’re a fan of those mentioned. They are classic 1970s sci-fi, indeed. Thanks so much for the read and the splendid comment, my friend. I’m so glad to see some often neglected films mentioned here. I’m thinking of The Andromeda Strain, Invasion of the Body Snatchers, Phase IV, and especially Time After Time. Great list. Welcome, John! Great to hear from another fan of these sci-fi gems. Thank you so much for the read and comment :-). Pretty good list you’ve compiled. I was happy to see TIME AFTER TIME included; a great, underrated movie. It certainly is, John! Love it that Time After Time fans are making it here. Many thanks, my friend. Seeing the first two made me very happy. I have yet to see many of the films on the list which makes me excited as I have much to learn and now see from this post. Can’t go wrong with that top two! Let me know what you think once you view those mentioned, mummbles. Many thanks :-). I want you to know that I loved your point about our perception of things depending on our age at a specific time and place. Unquestionably my more youthful exuberance during the 1970s truly cemented films that indeed still mean a great deal to me. IF I was a little older I might have seen those things much differently. Great point. Thank you so very much, G. Much appreciated. 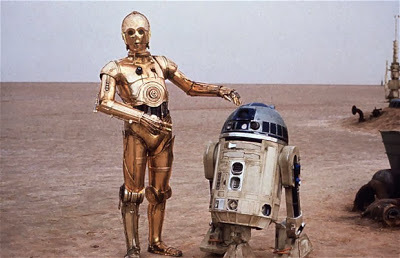 The 70s was a monumental time, with some equally wonderful film. In this genre especially. Wow, I am sorely lacking in 70s sci-fi it seems. I have only seen the first two on your list. I’m going to have to bookmark this so I know what to check out next. Thanks, Michael! You’re welcome and thank you very much, Eric.